I mean, dudes, I drive a freaking MINI-VAN. It even has a plate on the front that SAYS 'Soccer Mom'. Yes, it's tongue-in-cheek, but is it? And my kids actually DO play soccer, so it's kind of official. I even got called a soccer mom at Fifi's Girl Scouts meeting. Yeah, because my daughter is in Girl Scouts too. What else could I possibly do to be even more Soccer Mom-y? 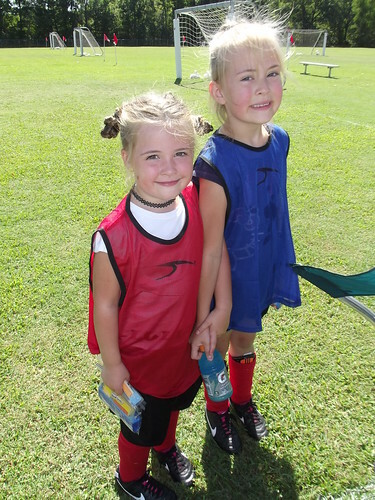 Well, today was my little girlies' first soccer games. Lolly's team kicked the other team's butts, while Fifi's team got their butts kicked. But it was all in good fun. Lolly's team, the Lil Red Banans, played great. 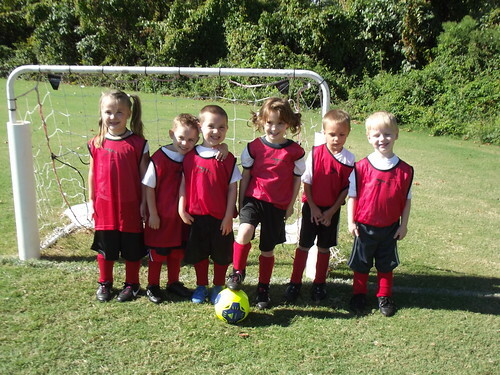 They may be a bunch of four year olds, but there are seriously some good players on her team. Lolly is more interested in just running around and helping up the kids who have gotten knocked over, than actually scoring a goal, but she played well. She even got in a few really good tackles and set up some nice goals. And it was fun shouting, 'Go Bananas!!' the whole time. Fifi's team was at a slight disadvantage. 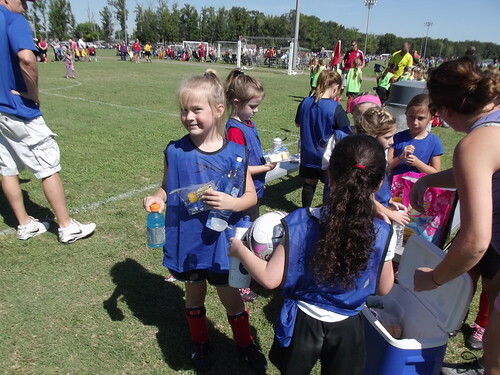 Being in the U8 division, her team somehow ended up being all 6 and 7 year olds, and they played against a team of all 8 year olds. And that team just happens to also be the team with a drill sergeant coach who works those girls as if they were playing for the Women's Internationals. Our coach is doing a good job, but he coaches like he's coaching, well, a girls' U8 team. Regardless, Fifi's team tried hard, and Fifi even scored a goal and showed some real promise as a keeper. Being a Soccer Mom (or 'Soccer Mum' with a faux English accent, as I prefer to call myself) isn't so bad when you see your kids learning a new skill, getting some exercise AND having a blast all at the same time. And besides, it could be worse; they could be playing AMERICAN FOOTBALL. Hashtag Shudder.